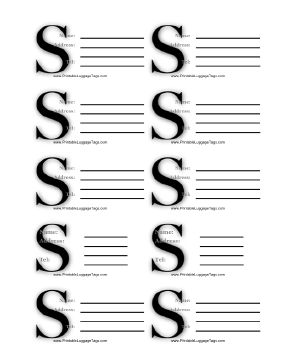 Sheet of ten luggage tags, each monogrammed with the letter S.
This free luggage tag is available in two versions: an Adobe PDF file and a Word DOC file. Download the PDF version, open it in Adobe Reader, print it out, and fill in your information; or download the DOC version, open it in Word and edit your information, and print it. You can print these printable luggage tags on heavy paper, or use specialty business card stocks. If you don't see a luggage tag design or category that you want, please take a moment to let us know what you are looking for.